So, a little learning experiment in F#/WPF. 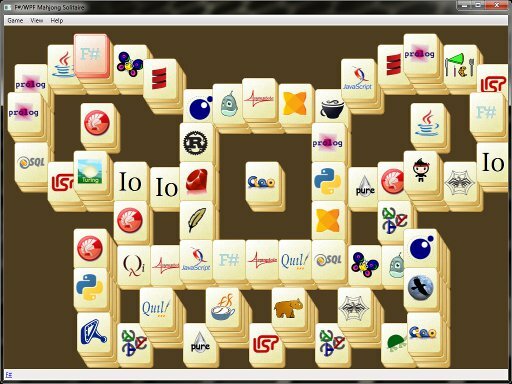 It's a Mahjong solitaire puzzle, with the (already somewhat familiar) "programming languages" twist. The images on the stones correspond to different programming languages. The player can open a web page with the information about the language on the currently selected stone, by clicking an URL in the status bar. Being a side effect of slow background learning of F#, it's neither idiomatic nor elegant, not a "tutorial" or anything... not "how to do things", but rather "how I did them at the first attempt". In fact, it's even not a program, but a script (.fsx) with everything lumped together - the result of experimental type of development, when you write small pieces of code, evaluate them on the fly in the REPL (AKA "F# interactive") and almost instantly see what happens. But I figured I'd reflect on this anyway, so here we go (btw, the code is available on github). mahjong.fsx - the game script itself. It can be run, for example, by opening it in Visual Studio (I used Visual Studio 2010), pressing Ctrl+Alt+F to open F# interactive, Ctrl+A to select all code and then Alt+Enter to evaluate it. The script itself, mahjong.fsx goes like this. At the beginning, we import the used assemblies, the "script way". 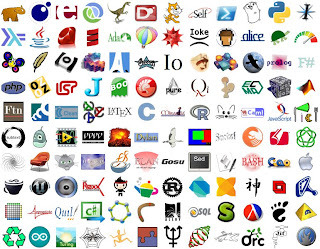 The ones here are needed in order to use WPF. Here we first tell which (WPF) assemblies we will use, and then import a few particular namespaces from those assemblies. F# has an extensive set of library functions for manipulating with containers, but sometimes it's not enough and we'd want to define our own. The first one tries to apply function to the argument until it returns Some() option (or the number of attempts reaches maxDepth, in which case the total result is None). It's a recursive function, using tail recursion. We'll need it for e.g. trying to shuffle the stones in such a way that the board is solvable. Now we use F# ability to extend existing modules and add some extra array manipulation functions. It is implemented by peeking into the source code of the core F# library and modifying it to our needs (that's why it might seem weird at the first glance... the core F# library code tries to do things in a way that has a good enough performance, which may not necessarily look like very idiomatic F#). Function shuffle returns a shuffled array. Internally, it creates the copy of the input array and after that does the good old in-place Fischer-Yites shuffling. Function replicate takes a subarray of the given input array, repeats it numTimes times in a row and returns the resulting array. The last utility function, fullPath is rather a hack, applicable only when we are doing this kind of quick-and-dirty REPL development. It returns a full path to file, assuming that this file is located in the same folder as the current script (which later will be used to load data files for the game). Here are the custom types our code will work with. The next, a discriminated union called StoneState, describes the possible three states in which every stone can be. Note that the stone becomes "Hidden" after the player "removes" it. The main data structure, Game is a bundle of all data describing one game session. Most of it is mutable (changes during a single game session). Note, that even though some of the fields may not appear to be mutable, in fact they are! This is one of the darker sides of the language. Since arrays and .NET objects are implicitly mutable, you basically never know if their elements have been changed or not. Thus, only StoneCoords are never de-facto changed after the object of type Game is created. Since a quick-and-dirty approach does not completely intolerate hardcoded values, we have a few here as well. To somewhat silence the feeling of guilt I've tried making them more explicit by bundling all together and naming with caps. let STONE_EXTENTS = 66., 78.
let STONE_3D_OFFSET = -7., -11. There are two types of game data that we load from files: board layout description and stone face description (the name of the corresponding programming language and URL of what is usually a Wikipedia page). The following are the functions that are reading these data from files and parse them into data structures to be used by the game logic. Each 2x2 ASCII cell corresponds to one stone, and the number inside the cell equals to the highest stone level at the corresponding location. Since there should always be a stone below another stone (except for level 0), such representation describes the board non-ambiguously. Note that the 2x2 cell representation is used in order to be able to describe those stones which have a half-stone position offset (in any or both directions). So, the following function, parseLayouts, converts the text representation of a single board layout into array of tuples (column, row, layer) for every stone on the board. The column and row are using the same 0.5-base coordinate system (i.e. one stone occupies 2x2 cells). The function internally uses an array (doing destructive updates on it), "peeling" out the stone coordinates layer-by-layer, starting from the top one. Another value, languages contains the array of Name/URL tuples for all the possible stone faces. The function isFree is used to find out if stone with given coordinates is "free", i.e. it can be removed from the board. By Mahjong solitaire rules, the stone is free when it does not have other stones on top of it and also there is no other stones to either left or right side (or both). This function is somewhat unusual - instead of immediately returning true/false it returns another function instead, and that function can be used to test if the stone is free. The reason for this is that we employ here a technique called memoization: we internally create a hash map that given the cell coordinates (in 0.5-stone based coordinate system) gives us the index of the stone, this hash map is "remembered" via a closure and can be reused for all the subsequent lookups. The function that is returned also takes the array of current stone states, so that we are taking into account already removed stones (they should not block anything). The next function, getFree uses the previous one to get the current list of free stones. Note that F# would "take care" that the costly isFree coords is called only once and it's just the the resulting function that is reapplied (curried) to all of the coordinates. The next two functions, arrangeRandom and tryArrangeSolvable, both shuffle the given arrays of stones in a random way. The difference between them is that the first one is doing this plain randomly, while the second one tries to create the order that is both random and solvable. Most of the existing Mahjong Solitaire implementations have a "shuffle" button, but many of them do it without caring if the resulting shuffled layout is actually solvable at all. Which can be very annoying. It is possible, that the current board layout does not allow to create the solvable position at all (as a simple example, imagine that there are only two stones left, one on top of another). That's why the shuffling is attempted several times before giving up. In case when there is only one free stone remains on step 5, we don't know for sure if that's because of the unsolvable layout or because of the way we've been choosing the stone pairs on step 3. We will represent every stone's visual with a pair of WPF Rectangle objects: one for the background image, and one for the face image on top of it (yes, it's far from being an efficient/elegant way of doing this, but it will do for now). Finally, the very function that creates the initial pairs of WPF Rectangle's for every stone, createStoneControls. What comes next is imperative code that implements player actions via mutating the current game state object (of type Game, described earlier). 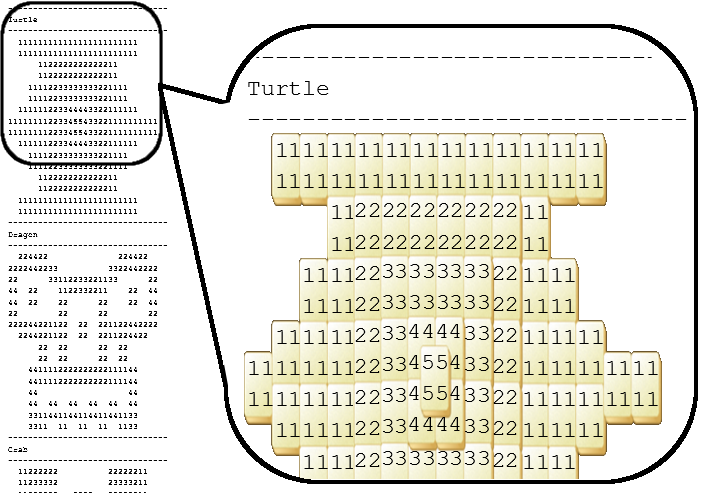 The first function, newGame, returns a new pristine game state object with given board layout. That (mutable) object, game is further created. There is also a helper function startGame, which wraps the new game object creation. showFreeStones - select all the stones that are currently "free"
Every of them has explicit "update the stone visual" as the last step, because every of these actions would affect stones appearence in some way. Now, while this is straightforward, it does not seem to be elegant at all. It feels that there should be some better way of handling the propagation of state change to get reflected by the visual appearance. But let's return to it later and stick to what kind of works for now. Function hideLayers changes the transparency of +/-delta given stone layers, such that it's possible to see what's beneath the top layers. This feature tries to make our Mahjong Solitaire puzzle into a game with full information (otherwise it generally would not be possible to deterministically come up with a proper stone removal strategy without seeing what's beneath the top stones). Function clickStone handles the event of a stone with given index having been clicked. Depending on the context, that can result in either selecting the stone, or stone pair removal, or unselecting all the stones etc. The final part is responsible for the input: mouse clicks on the board and menu item clicks. That's all. There are many questions unanswered and things to improve here. I hope to address some of them later.